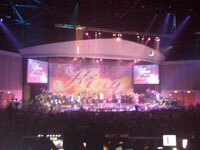 This is my second Christmas program as a tech director. Last year’s program was pretty good once it happened, but leading up to it almost killed me. This year was a marked improvement in organization and execution. In the weeks before the program, I really dislike the Christmas Season, but all it takes is one performance and I’m in the mood and will be looking forward to the putting the program together again next year. With each program we do, I get the opportunity to work with new people and do a program that is out of the normal Sunday service and I get to learn and improve my skills. Last year I learned much on the technical side of lighting and how to call cues and produce a more theatrical type program. This year I had the opportunity to learn as well, but in different kinds of ways. One thing that comes to mind is that practice really helps not only the performers, but the tech team as well. I knew that was the case, but it was really emphasized when the audio team really nailed the orchestra mix. The video team as well knew exactly where the action was and what camera to shoot it with. I also learned how hard it is for someone to come into a presentation like “Imagine” and light it well. For the past two years we have hired out the lighting design; both groups did the best that they could and I do like seeing the different styles of lighting and how they can effect the look. I just don’t know if they fully understand the scope of dance, ariel and drama until the fixtures are hung. At that point it is (most of the time) too late to fix the issues. For example the lighting plot had top light on the ariel actors. Top light is a very dramatic effect that I like. The problem was that the actor was performing about 20 feet in the air and that put them about 10 feet off the light. The shaft of light is just too small at that point and the aerialist would swing in and out of the light. Bottom lighting would be a better effect in this case. The other struggle that I have is with the video lighting. Being that the lighting designer is not familiar with the camera and needs, the design doesn’t usually account for color temp changes of the lights used. In this program, the key lighting came from two main sources. Spotlights that were 1200 watt and a HMI based lamp that were about 4200k temp. The other was High End Studio Commands 1200 watts that were 5200k temp and didn’t mix well with the cameras that were balanced to the spots. This year, as last year, proved to me that creatives are passionate about what they do and the most heated discussions are about differences this time of year. That will never change. My list is long for what I would like to change for next year’s performances, and I can’t wait to get started on the planing even if I still don’t have the worship center put completely back together.